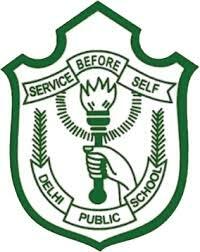 Delhi Public School,Chandigarh has advertised for the recruitment of Teaching Faculty- Non Teaching Faculty vacancies. 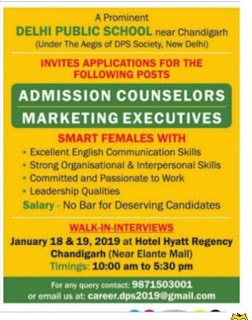 Interested and eligible job aspirants are requested to walk in interview on 18-1-2019 & 19-01-2019.Check out further more details below. Name of the School: Delhi Public School, Chandigarh. About School: DPS,Chandigarh, established in 2003 provides a truly enabling environment to contribute to the holistic development of each student. With a modern building housing a striking Sports Complex, State-of-the-art infrastructure and spacious classrooms, DPS Chandigarh is indeed a feather in the cap of the ‘City Beautiful’. The school is alive to the challenge of moulding students to be life long learners by developing their skills as academic achievers, progressive thinkers, effective communicators and empowered citizens who ‘think local but act global’. The transformation from a green field site to a school bustling with about 3500 students in just ten years bears testimony to its phenomenal growth and the school’s commitment to excellence. Salary Package: No bar for deserving candidates. 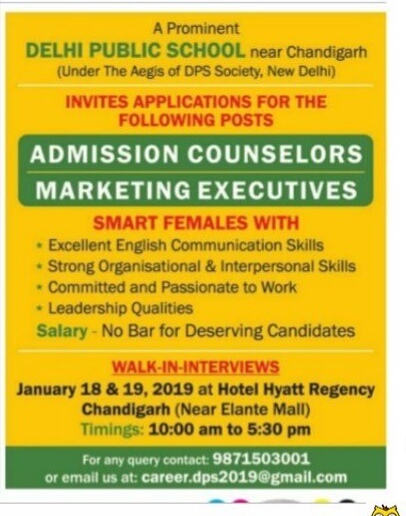 How to Apply: Walk-in interview on 18th&19th January between 10a.m to 5.30p.m at hotel hyatt regency.Near Elante mall.